Scar revision surgery refers to a group of procedures that are done to partially remove scar tissue following surgery or injury, or to make the scar(s) less noticeable. The specific procedure that is performed depends on the type of scar; its cause, location, and size; and the characteristics of the patient's skin. Scar revision surgery is performed to improve the appearance of the patient's face or other body part, but it is also done to restore or improve functioning when the formation of a scar interferes with the movement of muscles and joints. The shortening or tightening of the skin and underlying muscles that may accompany scar formation is known as contracture. Contractures may interfere with range of motion and other aspects of joint functioning, as well as deform the shape of the hand or other body part. Contractures in the face often affect the muscles that control facial expressions. Scar revision surgery may be considered as either a cosmetic procedure or a reconstructive surgery, depending on whether the patient's concern is primarily related to appearance or whether contractures have also affected functioning. Some insurance companies will cover the cost of scar revision surgery if the scarring resulted from injury. Patients who are considering scar revision surgery should consult their insurance carriers to learn whether their condition may be covered. The demographics of scar revision are difficult to establish precisely because of the number of different procedures that are grouped under this heading and the different types of scars that they are intended to treat. In addition, although dermabrasion and laser resurfacing of the skin are often described as surgical methods of scar treatment to distinguish them from medical modalities, they are usually listed separately in statistical tables. According to the American Society of Plastic Surgeons (ASPS), in 2001 the number of procedures, by type, were as follows: 227,911 for scar revision; 51,065 for dermabrasion; 175,927 for laser resurfacing; and 1,035,769 for microdermabrasion. The female to male ratio for scar revision surgery is about four to three, whereas women are almost five times as likely as men to have laser skin resurfacing and almost 13 times as likely to have a microdermabrasion procedure. Most patients who have scar revision surgery are between 15 and 39, although a significant number choose to undergo this type of surgery in their 40s and 50s. It is difficult to compare scar revision surgery with other treatments across ethnic and racial groups because skin color is a factor in the effectiveness of some forms of therapy. In addition, some types of scars—particularly keloids—are more likely to form in darker skin. On the whole, it is estimated that between 4.5% and 16% of the United States population is affected by keloids and hypertrophic scars. These are the most difficult scars to treat, and are discussed in further detail below. Inflammation. This phase begins right after the injury and lasts until the wound is closed. It is the body's way of preventing infection, because a wound is not sterile until it is covered by a new outer layer of skin. Transitional repair. Scar tissue is formed during this phase to hold the wound together. The length of this phase depends on the severity of the injury. Maturation. This phase usually begins about seven to 12 weeks after the injury occurs. It is also the phase in which problem scars appear. Under normal conditions, a repair process takes place in which the development of new skin is combined with breaking down the scar tissue that was formed in the second phase of healing. Problem scars may result from inflammatory diseases—particularly acne; trauma can include cuts and burns, previous surgery, and a genetic predisposition for skin to overreact to injury. Tension on the skin around the wound, foreign material in the wound, infection, or anything that delays closure of the wound may also contribute to scar formation. Timing. Hypertrophic scars usually begin to form within weeks of the injury, whereas keloids may not appear until a year later. Growth pattern. Hypertrophic scars do not continue to grow after they form, and remain within the original area of injury. Keloids continue to grow and spread outward into normal tissue. Role of genetic factors. Keloids tend to run in families, whereas hypertrophic scars do not. Racial and age distribution. Keloids occur more frequently in persons with darker skin than in fair-skinned persons. They are also more likely to develop during adolescence and pregnancy, which are periods of high hormone production. Recurrence. Hypertrophic scars may fade with time and do not recur. Keloids, on the other hand, may recur even after surgical removal. Collagen structure. The collagen fibers in a hypertrophic scar are shorter and generally arranged in a wavelike pattern, whereas the collagen fibers in keloids tend to be randomly arranged. The treatment of scars is highly individualized. Most plastic surgeons use a variety of nonsurgical and surgical approaches to improve the appearance of scars. In addition, patients might need several different surgical procedures if their scar revisions require a series of operations at different stages of the healing process. Surgical excision is a procedure in which the surgeon shaves down and cuts out scar tissue to reduce the size of the scar. This technique is most commonly used on large scars that cannot be treated adequately with medications or other nonsurgical means. When excision is done in stages, it is referred to as "serial excision." This is performed if the area of the scar is too large to remove at one time without distorting nearby skin. Flaps, grafts, and artificial skin are used to treat contractures and large areas of scarring resulting from burns and other traumatic injuries. When there is not enough skin at the site of the injury to cover an incision made to remove scar tissue, the surgeon implants a skin graft or flap after cutting out the scar tissue itself. Skin grafts are thin layers of skin that are removed from another part of the patient's body and carefully matched to the color and texture of the face or other area where the graft is to be placed. A skin flap is a full-thickness piece of tissue with its own blood supply that is taken from a site as close as possible to the scarred area. Dermal regeneration templates, often called "artificial skin," are used to treat people with contracture scars or severe burns. These devices were approved by the Food and Drug Administration (FDA) in April 2002. The templates are made of two layers of material, a bottom layer composed of collagen derived from cows and a top layer made of silicone. To use the artificial skin, the surgeon first removes all the burned skin or scar tissue from the patient's wound. The collagen layer, which is eventually absorbed, allows the patient's body to start growing new skin while the silicone layer closes and protects the wound. After 14–21 days, the silicone layer can be removed and a very thin graft of the patient's own skin is applied to the surface of the wound. The advantages of using a dermal regeneration template are that it lowers the risk of infection and minimizes the amount of tissue that must be removed from the patient's other body sites. Z-plasty and W-plasty are surgical techniques used to treat contractures and to minimize the visibility of scars by repositioning them along the natural lines and creases in the patient's skin. They are not usually used to treat keloids or hypertrophic scars. In Z-plasty, the surgeon makes a Z-shaped incision with the middle line of the Z running along the scar tissue. The flaps of skin formed by the other lines of the Z are rotated and sewn into a new position that reorients the scar about 90 degrees. In effect, the Z-plasty minimizes the appearance of the scar by breaking up the straight line of the scar into smaller units. A W-plasty is similar to a Z-plasty in that the goal of the procedure is to minimize the visibility of a scar by turning a straight line into an irregular one. The surgeon makes a series of short incisions to form a zigzag pattern to replace the straight line of the scar. The primary difference between a Z-plasty and a W-plasty is that a W-plasty does not involve the formation and repositioning of skin flaps. A variation on the W-plasty is known as the geometric broken line closure, or GBLC. Skin resurfacing and dermabrasion are techniques used to treat acne scars or to smooth down scars with raised or uneven surfaces. They are known as ablative skin treatments because they remove the top layer of skin, or the epidermis. In dermabrasion, the surgeon moves an instrument with a high-speed rotating wheel over the scar tissue and surrounding skin several times in order to smooth the skin surface down to the lowest level of scarring. Laser skin resurfacing involves the use of a carbon dioxide or Er:YAG laser to evaporate the top layer of skin and tighten the underlying layer. Keloid or hypertrophic scars are treated with a pulsed dye laser. Dermabrasion or laser resurfacing can be used about five weeks after a scar excision to make the remaining scar less noticeable. Laser skin resurfacing, however, is less popular than it was in the late 1990s because of increasing awareness of its potential complications. The skin of patients who have undergone laser skin resurfacing takes several months to heal, often with considerable discomfort as well as swelling and reddish discoloration of the skin. In addition, there is a 33–85% chance that changes in the color of the skin will be permanent; the risk of permanent discoloration is higher for patients with darker skin. As of 2003, some plastic surgeons are recommending laser resurfacing only for patients with deep wrinkles or extensive sun damage who are willing to accept the pain and permanent change in skin color. Preparation for scar revision surgery includes the surgeon's assessment of the patient's psychological stability as well as the type and extent of potential scar tissue. Many patients respond to scarring following trauma with intense anger, particularly if the face is disfigured or their livelihood is related to their appearance. Some people are impatient to have the scars treated as quickly as possible, and may have the idea that revision surgery will restore their skin to its original condition. 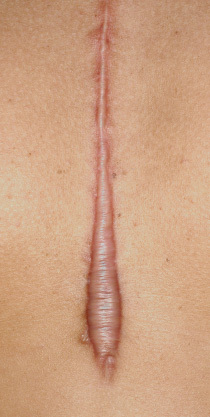 During the initial interview, the surgeon must explain that scar revision may take months or years to complete; that some techniques essentially replace one scar with another, rather than remove all scar tissue; and that it is difficult to predict the final results in advance. Most plastic surgeons recommend waiting at least six months, preferably a full year, for a new scar to complete the maturation phase of development. Many scars will begin to fade during this period of time, and others may respond to more conservative forms of treatment. The patient is considering scar revision surgery to please someone else—most often a spouse or partner. The patient has a history of multiple cosmetic procedures and/or complaints about previous surgeons. The patient has an unrealistic notion of what scar revision surgery will accomplish. The patient seems otherwise emotionally unstable. In addition to discussing the timing and nature of treatments, the surgeon will take a careful medical history, noting whether the patient is a heavy smoker or has a family history of keloids, as well as other disorders that may influence the healing of scar tissue. These disorders include diabetes, lupus, scleroderma, and other disorders that compromise body's immune system.